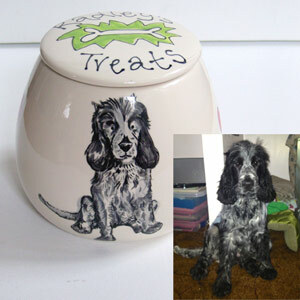 Dog treats jar beautifully hand painted and personalised in a pottery studio near Cheltenham, UK. 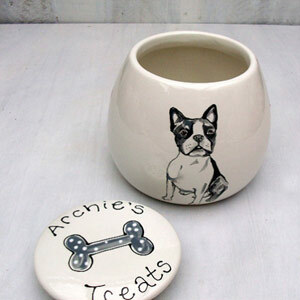 These ceramic jars are perfect for storing your dog's favourite treats and biscuits. Each jar features not only your dog's name but also a wonderful portrait representation of your dog from the photo you provide. 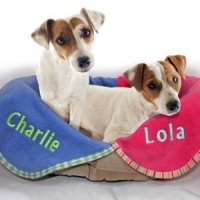 Simply upload your photo when you place your order and your dog's image and name will be painted just for you, carefully by hand. No transfers or cheap shortcuts. 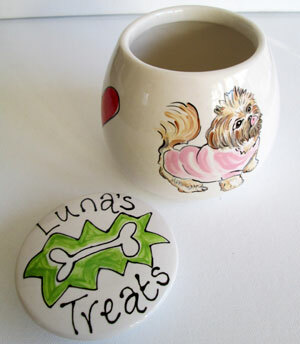 Each jar also features cute red hearts on the sides. 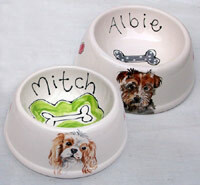 Your dog's name is painted on the lid along with your choice of a bone painted on green or a grey dotty bone. 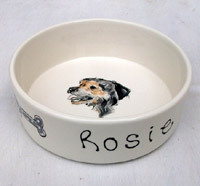 One painted dog is included in the price but each jar can have up to three dogs painted on, for an additional artwork fee per additional dog (please see above). 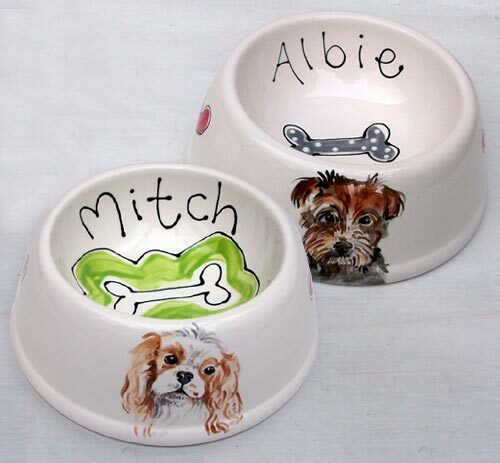 The colourful and fun illustrations are hand painted onto high quality earthenware pottery which is then glazed and kiln fired at 1200 degrees producing a permanent finish which is also dishwasher safe. 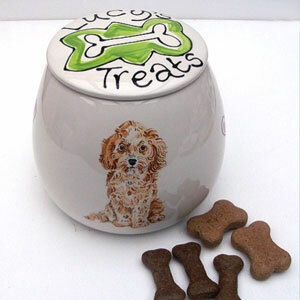 These bespoke dog treat containers make the perfect gift which you won't find on the high street. 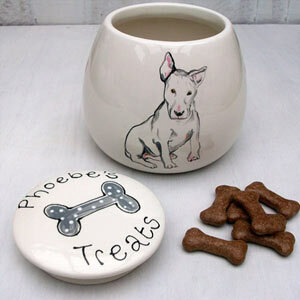 All the designs are sketched and laid out before being hand drawn onto high quality bisqueware. 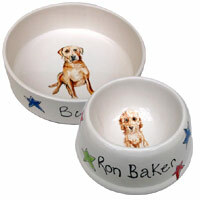 The drawings are then carefully hand painted with a tiny brush and a steady hand using underglaze paints. The pottery is then glazed and fired in a kiln (not an oven) to ensure a lasting finish that will be dishwasher safe and will not fade or peel. 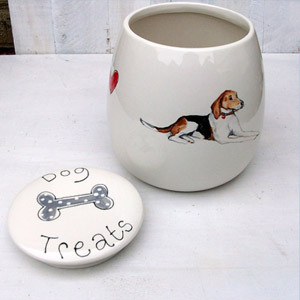 These ceramics make wonderful gifts for dogs and dog lovers. They are sure to be treasured for years to come. Small is approx. 13cm tall and 13cm at the widest point. 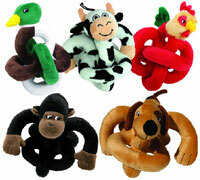 Holds approx 1 litre. Large is approx. 18.5cm tall and 17cm at the widest point. Holds approx 2.5 litres. 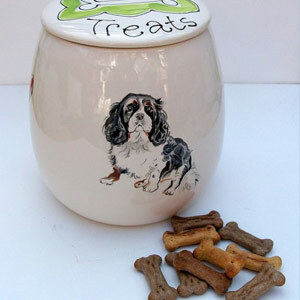 I have an assistance dog who gets regular treats for helping me and having this really lovely personlised treat jar is not only useful now, but will also remind me of my wonderful friend later on.